Jon Spencer Reviews – Reviews From Anime to Board Games, and More! Which Title Took Home the Gold? Enough anticipation though. Our big winner today is Run With the Wind! This is the first time that a recently aired show has ever won. I really wanted to watch this anyway, so now I have the perfect excuse. For those who don’t know, the source is by the same person who did The Great Passage, which was a show I absolutely loved. I don’t expect this to be quite that good, but it may just surprise me. A lot of you folks seemed to enjoy it, so I’m sure you’ll be anticipating my thoughts on this one. As usual, I’ll leave the full results below for your viewing pleasure. If you need some content to hold you over until I get this article out, I’ll be posting every M/W/F at 11:00 AM PST unless otherwise noted. Additionally, be sure to check out my look at Cowboy Bebop and its film or consider exploring the big alphabetized list of every anime I’ve reviewed. *Please note that Recovery of an MMO Junkie and Rascal Does Not Dream of Bunny Girl Senpai would not have been counted toward the official vote had they won. I already have reviews of each series on the site in my alphabetized list, which is listed in the voting rules. In future rounds, please be sure to utilize that resource to ensure that your vote is not wasted. It took a long time for DC to get the formula right for a fun, light-heated adventure like ‘Shazam!’, but here we are! In a world saturated by superhero movies, one rises up to prove itself to be a little different than the rest, and that turns out to be a good thing. 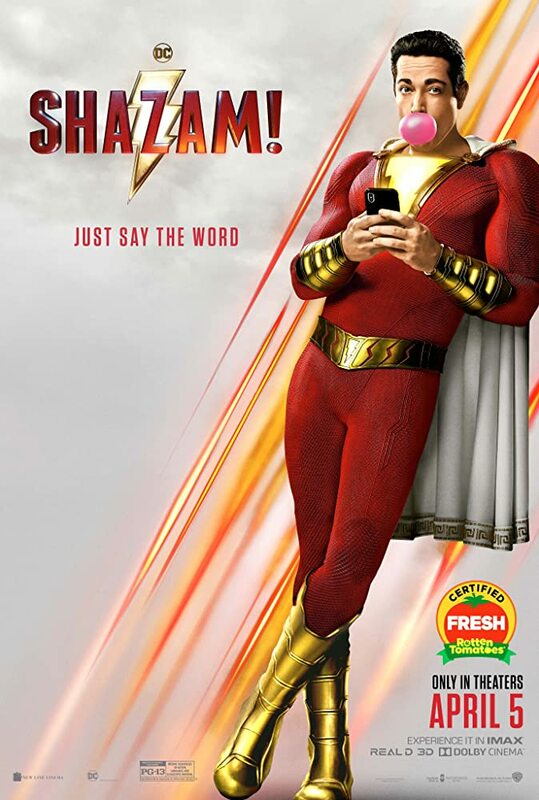 It is hard to believe we came a long way from the dark, grey matter that was ‘Man of Steel’ to a bright and colorful rainbow known as ‘Shazam!’; it has the makings of ‘Big’ if it were a superhero movie and has the giddy childlike nature to show, but does not risk its intensity and punches to make for an entertaining action movie. You know that feeling when you find something really fun and you just want to keep doing that thing but eventually you overdo it and kind of burn out on it? That’s kind of what happened with Kaguya for me. At the start of the season I had wanted to make an article (which I unfortunately didn’t get to do) about how much I was LOVING this show, but now that it’s over, I can’t help but notice I lost a good chunk of that enthusiasm. Despite that, this was one of the better shows this season for me. The best way for me to explain this show is to use other shows as an example. 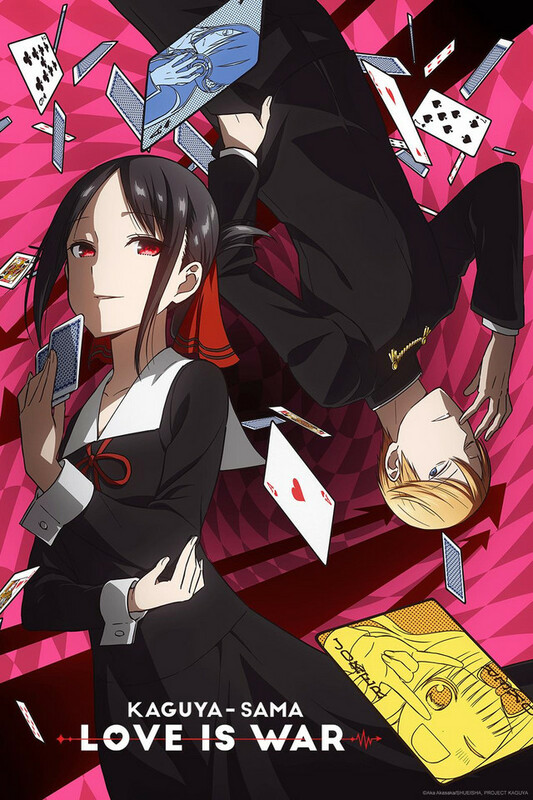 Kaguya-sama: Love is War takes the best parts of Kaiji and the back-and-forth of Death Notes, but with none of the actual stakes. This isn’t to say that the characters don’t genuinely believe there are high stakes here, that’s what makes it so fun, because the efforts they go to over something that is relativity trivial, is pretty funny. Each episode has the titular Kaguya and Miyuki squaring off, trying to get the other to confess their love. This is accompanied by over-the-top narration, Kaiji style paired with inner monologue from each character, akin to Death Note. Things usually go awry though thanks to their friend Chika. That’s about the gist of the show, well the first half at least. Up until just after Ishigami’s character was introduced, the show was a fantastic time and I really looked forward to watching it each week. I should note I started in on this one late, like after it was already 5 episodes in, and binged it pretty fast. In fact, I even watched the episodes over with another friend. However, after that, the show kind of started outstaying its welcome. I wasn’t outright disliking it or not having fun, but the jokes started to fall flat, the pacing felt off, and something was just… missing. Kaguya had a nice conclusion though that brought things back up a bit for me. It’s left me feeling a touch conflicted though because I want to see more, but at the same time, I also want the show to mix it up a bit. There’s a common complaint levied at comedy shows like this, and it’s that the jokes get repetitive. I don’t think that is really the chief problem here, however, but I could see an argument to be made there. Instead, I’d say that the structure of the episodes is what changed and that is what caused the shift. There was suddenly less focus on these bombastic overly complex love plots and more just kind of boring typical romance stuff. It just didn’t work here. Still, I would recommend watching Kaguya anyway. If for anything, it would be for the OP, “Love Dramatic” which was easily the best of the season both musically and visually. I listen to that song even now, it’s that good. If I had to describe the OP I would say it is like watching every James Bond opening all at once (from a stylistic sense) but with a more fun and upbeat musical backing. Ah, that reminds me, episode three has a special ending theme that was reminiscent of Lucky Star or Haruhi. The only reason that exists is because there was some source that didn’t get adapted and they “needed” to have a plot point make sense. I wish there would have been more stuff like that, and judging by how it took the internet by storm, it seems most people would agree. Kind of surprised by how little I actually have to say here. At the start of the season I thought I’d have a lot to say, but that’s about it. The show was fun, but it had its fair share of flaws. 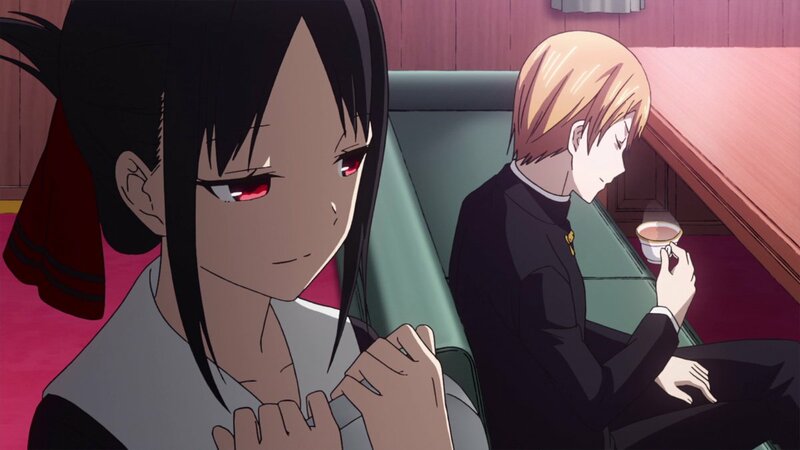 Kaguya also wasn’t my favorite show of the season like I thought it would be, but it was still pretty close despite what I said. All-in-all, I’d say that’s a win. What were your thoughts on Kaguya? Did the show manage to keep you hooked all the way through or was it a disappointment? Let me hear your thoughts in the comments. If you want to help me out because you enjoy my writing, use my donation button below please. I would appreciate that. Thanks for stopping by and hope to see you around again soon! How About a Derivative Version Then? The last vote, for what was supposed to be “Q” ended up being a redemption round. The winner of that ended up being Cowboy Bebop. However, there are plenty of “R” titles so we’ll be doing normal votes as we make our way to the end of the alphabet! Anime ABC’s R Voting Round Link <- Click Me! Voting is open from today until 4/23/19 11:59 PM as usual. Not Sure What Anime ABC’s Is? Anime ABC’s is a fun community focused event that I run here at Jon Spencer Reviews. Any and all people can participate in this event, even if you know nothing about anime! So how exactly does this all work? It’s simple! Just follow the link above and vote for as many of the listed shows (or provide your own) that seem interesting to you. Each round moves to the next letter in the alphabet, so the current “P” round is the sixteenth anime ABC’s. This is done to keep things interesting and to allow for more variety with each passing round. Be sure to click on any of the titles listed to see what a finished product will look like! What are you waiting for? Vote now and have your say in what anime I review next! I know it’s not everyday that we get a horror anime, or something that even gets close to touching the cat-and-mouse of Death Note, especially not as a Shonen Jump adaptation, but The Promised Neverland never reached the heights for me like it seemingly did for everyone else. This isn’t to say that I didn’t enjoy it, I totally did, and it had some great moments, but overall this was a pretty standard experience for me. Outside of (jokingly) suspecting Phil each episode of course! Our story is about three kids, Norman, Ray, and Emma. They all live idyllic lives at Grace Field, an orphanage, with their beloved caretaker, Isabella, whom they refer to as “mamma”. I shouldn’t even have to explain where things go from here. Insert quote about, “then suddenly, everything changed when they learned the horrible truth” or whatever. It’s extremely obvious right away that this isn’t going to be some happy-go-lucky anime. Just looking at the iconography of the poster for the show gives it up. The entire first episode twist isn’t even trying to be hidden. I actually don’t think this is that big of an issue but the show received a lot of praise for this first episode. 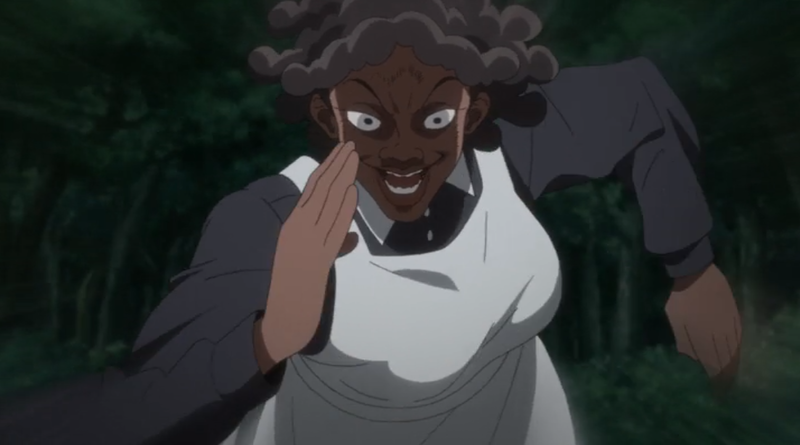 While I think it is a decent episode, The Promised Neverland is not really good at keeping things to itself. The mystery elements are lacking. Really the focus is on the back-and-forth of the kids who learn the truth and their caretaker. They want to escape their fate but are at a severe disadvantage, despite their great intellect. For awhile, the show totally gets away with having some slower pacing by consistently working at this goal. New threats are introduced in Sister Krone, and there are some genuinely creepy changes (some of which weren’t even in the original source material). However, there were a few points where the pacing took notable hits. The first being when the kids discover the secret code in the library, which seems like something relevant for season two, because it doesn’t go anywhere. They spend almost a whole episode on it though, which just feels kind of wasteful. Second time was when Ray revealed the dumbest piece of information I’ve seen in awhile. Not even gonna label this as a spoiler, because it is that stupid. Ray states that he can remember everything since he was a FETUS. Not like, a baby, or something, nope ever since he was in the womb. While this is a real thing (though very rare) for very young children, it just completely ruined the tension of its episode. I constantly made fun of it, because the show kept reminding me about it. When Neverland is on its game though, it is good. It doesn’t reach the same heights, but has a quality that reminds me of Death Note. Watching the kids and the caretakers try to stay multiple steps ahead of each other was a good time… usually. Speaking of the characters, that is where the show does its best. The kids are a little one-note, but Isabella especially has a lot of depth. As the main villain of the season, she is sympathetic and quite nuanced. I loved that they also tied in this musical motif (should mention, the music for this show is easily the best part) into her backstory for the final episode, it was a great touch. Whenever she was on screen, Isabella always had this looming presence. Almost like she was giving the kids these condescending looks while pretending to be an ideal mother to them. However, she does does all of this with good reason. I can appreciate her situation and why she works so hard at getting these kids to believe the lie of their perfect lives, and stopping those who do realize the illusion. There’s a scene where Isabella offers Emma a job like hers when she discovers the truth and it is totally reasonable. Unlike a lot of folks, I don’t think Isabella is actually an evil character. She’s just a person making the best of her desperate situation. In the end, she isn’t really even trying to stop the kids from escaping or knowing the truth. This brings me to the ending. I did find this to be the best part, not because it was over, but the resolution to all the buildup, which is 90% of the show, was finally given. Isabella had her fantastic character moment, and things wrapped up nicely with room for the upcoming second season. Come time for season two, I will be watching but I’m not dying to see it or anything. Ultimately The Promised Neverland was a decent show with a good first season. It’s going to really need to step up in season two though. If it manages that, I think this has the chance of being a great horror/mystery show that will be talked about for a good time, but time will tell on that front. What are your thoughts on The Promised Neverland? Was this your top show of the season or were you like me, and just kind of enjoying it? Let me hear your thoughts in the comments! If you feel like supporting my work please make use of my donation button below. Thank you for reading and I hope to see you back here at Jon Spencer Reviews again soon! You are probably wondering how a sequel to a ‘Groundhog Day’ wannabe manages to work, especially being that it is basically the same movie. Like a repetitive day, if one were to add some fun, charm, and plenty of twists, it essentially becomes enjoyable. While ‘Happy Death Day’ felt more like ‘Groundhog Day’, ‘Happy Death Day 2U’ feels like ‘Back to the Future Part II’ by focusing on the science of how Tree Gelbman (Jessica Rothe) got stuck in the time loop. 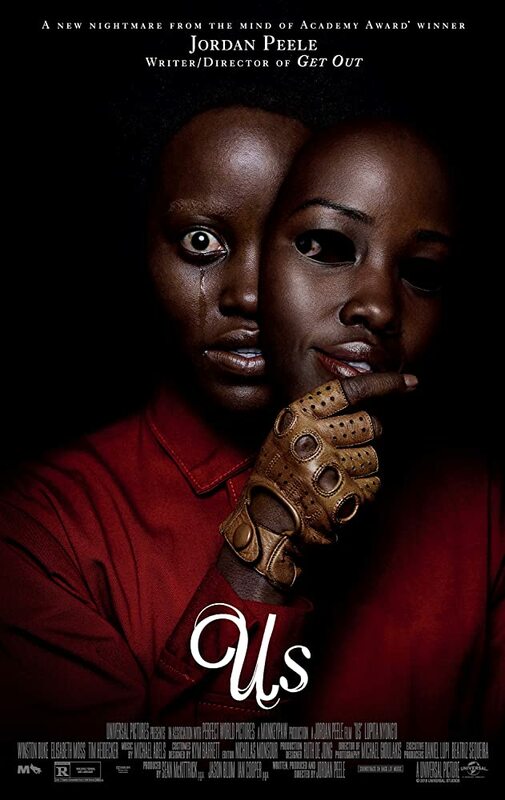 After the critical and financial success that was ‘Get Out’, for which writer/director Jordan Peele won an Oscar for ‘Best Original Screenplay’, the new mastermind of horror has now returned to give us… well… ‘Us’. It plays as a throwback to 70’s horror films with its cinematography and style, and as a feature-length ‘Twilight Zone’ episode with its themes and characters, yet one thing is for certain; Peele is a filmmaker that requires you to throw expectations out the door and pay attention, even if the results turn out as predictable as you expect for a horror film.